Soup of the day, main and side dish, dessert please ask for daily menus! 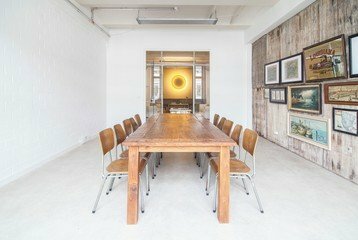 Situated in the heart of Wedding, just around the corner from Voltastraße U-Bahn station (U8) this meeting room combines effortless urban style with a spacious layout. 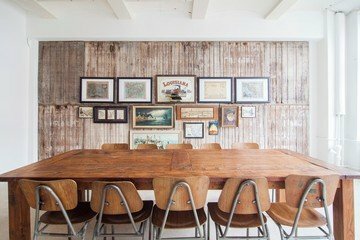 With a tall wooden table and straight-back chairs, this space is perfect for that serious yet classy meeting, whether it be a whole day conference call or a short workshop. 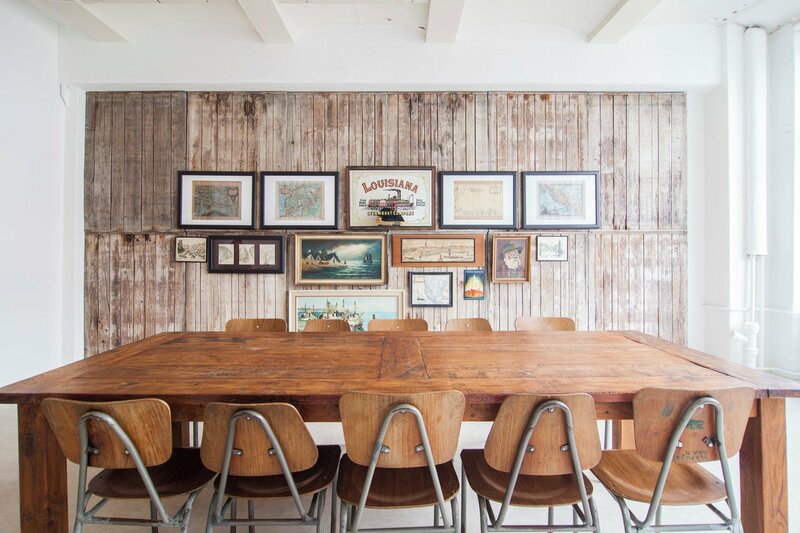 Furthermore, with its bright light throughout the day, the space will always feel cozy and inviting. This room in the Ahoy! Berlin could be rented both by young companies as a seminar room, as well as from more conservative companies who want to work in a relaxed, welcoming atmosphere. Depending on the arrangement of the seating, up to 25 people can be accommodated - and thanks to the flexible and affordable rental options, it could be used for a short conference call or for a two-hour meeting. The elevator in the building allows barrier-free access to the room - an essential point that should be kept in mind if you want to rent seminar rooms in Berlin. Another point is the technical equipment: If you want to rent this seminar room, you can also order a projector, a flipchart or even a whiteboard or a music system for a small fee. We also care about your comfort: a catering of cold or hot drinks, breakfast, lunch and an afternoon snack can be easily booked beforehand. Special highlight: Service staff is present on site. Getting to the room is easy either by car or by public transport. The U-Bahn stations Voltastraße and Bernauer Straße (U8), are only a few minutes walk away. The tram line M10 also stops at the latter, which allows you to reach Berlin Central Station without detours. The room could be rented out of the regular renting hours, which should be additionally negotiated. Before 9am and after 6pm an overtime fee of 25,00€ will be charged additionally per hour. Die Metaplan-Wände kamen leider zu spät und der Eingang ist schwer zu finden. Könnte besser ausgeschildert sein. Ansonsten war alles gut. Der Meetingraum war super, Service von Spacebase und der Location auch. Had difficulty finding the room, but the place was good. Hi, my name is Helena Servé.